Create a lovely way to honor a deceased loved one in a peaceful, natural setting with our Personalized Memorial Garden Stones. Place this touching Memorial Stone in your garden or at the resting place of your loved one as a great way to express your love, feelings and honor. 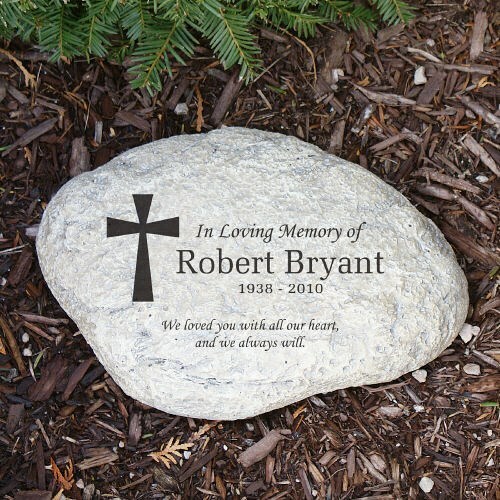 Your Engraved Memorial Garden Stone is made of durable resin and has a real stone look. Lightweight & waterproof, the Large Garden Accent Stone measures 11” W x 8” H x 1 ½” D. The Small Garden Accent Stone measures 5 ½” W x 4 ¼”H x 1 ¼”D. This Garden Accent Stones is designed for indoor or outdoor use. The engraving is highly detailed and durable with color and texture variations. FREE Engraving is included! We will engrave the garden stone with any name and dates. Please enter the dates exactly how you wish them to appear on the memorial stone. Large and Small Garden Stones are sold separately. I love it, I bought three and put them in my flower garden next to my mom, my dad and my sons favorite flowers. Fast delivery, product looks great. Perfect for our memorial plans. Additional Info Our Engraved Memorial Heart Clock and our Engraved Teardrop Keepsake also makes a lovely remembrance gift. For all of your Memorial Gift Ideas, be sure to always think GiftsForYouNow.com.